VAN WERT – Van Wert head football coach Keith Recker knows about athletic success at the high school level. As a football player at Delphos St. John’s, he helped his teams win a pair of state titles in 1998 and 1999 . As a basketball player, the Blue Jays won the 2001-02 Division IV state title. When he was hired as the Cougars head football coach in 2012, the hopes were for him to duplicate that success as the head man. This season’s Division IV success – the Cougars finished 9-3 and made it to the playoffs for the first time since 2000 – led him to being named the Lima News 2018 Dream Team Coach of the Year. “We started this year 1-2 and we had high expectation coming into this year with the number of kids we had back. We won our opener versus Bryan, a very good team, we then lost our first two Western Buckeye League games to Wapakoneta and St. Marys,” Recker said. “We weren’t sure how it would go after that. Our next game was against Ottawa-Glandorf; we led them by 16 with five minutes to go in the fourth period. They came back, tied it and we went to overtime. We dominated them in overtime and that seemed to click something in us for the rest of the season. That would be against Huron. That set up a rematch versus St. Marys. “We looked forward to playing them again with a chance to get revenge. Unfortunately for us, we weren’t able to win but it was a great experience; they just played so well,” Recker said. Recker’s current success started as a youngster, in his mind. As he continued to develop, he learned more and more. It wasn’t just football that he picked up. He had more to learn, not just form his coaches at that time but those he would have in the future. He had been the starting middle linebacker at St. John’s but was switched to tight end at the next level. After graduating from Hillsdale in 2006, he was offered a chance to coach the wide receivers at the school, which he accepted. He served in that capacity until he was offered a chance to be the head coach at Marion Catholic High School for a season. He then moved to Oak Harbor to be an offensive line coach – offensive line – for three seasons when he interviewed for the head coaching job at Van Wert. He was hired in 2012. 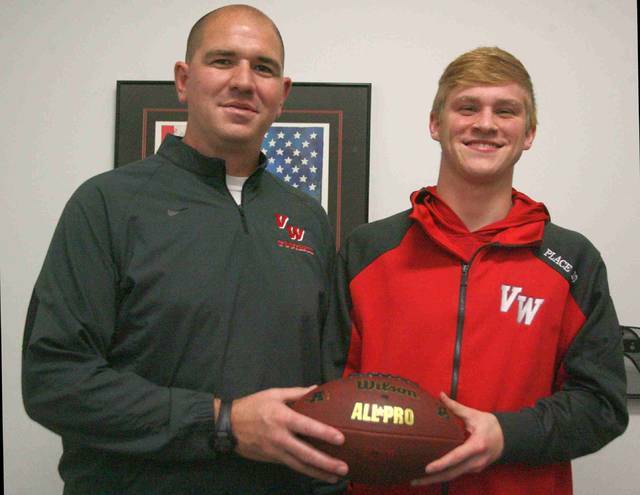 When he was hired at Van Wert, he had three goals in mind. “People forget Van Wert had a football tradition but that was in the 1950s through the 1980s; it had been a while since they were a consistent winner. The biggest thing I wanted to do was make sure in everything we did, to represent Van Wert well,” Recker said. “Next was to improve every day and finally, to bring home championships. If you do the first two things well, the third will come along. We wanted to build the numbers back up; that was our first order of business. We wanted to build camaraderie for this team. For example, we would go camping at East Harbor, pitch our tents and everything. It was a way to build this team up and you would be surprised at how well it worked. “For example, the guys would play volleyball against each other but you never knew who wanted to be teammates. That was good to see. The work, according to Rocker, is far from done. “We focused on raising the bar this season. With what this team did this season, we raised the bar every week and our goal is to not only maintain that level for next year but to raise it again,” Recker said. “That is a challenge. Our goal was and is to take it one day at a time and this team did a great job of focusing on what was next. We can’t really talk to the players for 30 days; we’ll bring them back in around Christmas and get back to work. We encourage our players to play other sports. I think that helps you in the long run. You learn other skills than just playing football and I think that benefits you athletically and in every way. For example, we have a number of guys that are going to wrestle. The leverage that you need to learn to be a good wrestler can only benefit you on the football field. Recker hopes that in the future, he can coach alongside his dad at Van Wert. “My Dad has been coaching at St. John’s for 30 years now and has been highly successful, especially as the defensive coordinator. When I first got the job at Van Wert, I asked him to come coach for me but he was too attached to St. John’s,” Recker said. “He’s a Blue Jay for life. I can still talk to him and I am hoping that he will eventually come to coach with me before it’s all said and done. That would be great. “My son is now following me around at practice. He is 7 years old and I can remember what it was like when I was a kid. He loves everything about practice. He will kick with the kickers when it’s time to do that. I hope I have instilled in him a love for this sport … all sports.